This was not Richter’s finest hour. These two concerto performances were given in May 1993 at the Schwetzinger Festival. You could call it ‘Richter Plays F Major’ if you like, or ‘Richter plays badly’ if you prefer. Both would be true. This brace of concertos has been issued before on Hänssler Classic HAEN 5196925, released back in 2010. 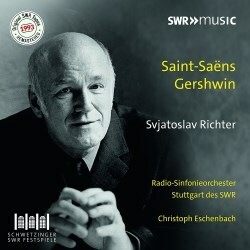 Its appearance here is in the context of the Festival using SWR Tapes – no huge difference audibly distinguishes the two releases – but whilst the sound quality is fine, nothing can mitigate Richter’s approach which is, not to put too fine a point on it, rather like his long drawn-out Schubert slow movements but without the Schubert. I can’t imagine anyone would voluntarily want to sit twice through his Gershwin Concerto. It can be defined in his own words as he is on record in Notebooks and Conversations as having listened to Entremont and Ormandy’s recording and saying: “Ouch!!! Can one really play the concerto like this? Fast, confused with no sense of rhythm…I’m amazed and dismayed…” Not, I suspect, as amazed and dismayed as most listeners will be at his arthritic progress through the Concerto, which is wholly devitalised. Eschenbach, with whom Richter enjoyed congenial relations, follows his pianist with professional dedication but he can’t bring lift where none exists and the big moments go for nothing. There’s lassitude instead of feeling and doctrinaire tempi and a dogged refusal to embrace joy. The Saint-Saëns Concerto fares better - but not by much. Where is the animato in the first movement and where – to cite the pianist Richter disliked in Gershwin – is Entremont’s joie de vivre in Saint-Saëns? He famously recorded all five concertos. In comparison Richter jog-trots his way through and the slow tempi again prove rhythmically ruinous. There is some quiet nobility in the central movement and there are traces of beautiful, refined phrasing as well, but too much remains uncharacterised, let alone under-characterised. If you want to hear this Concerto properly just start with some pianists beginning with a ‘T’ – Thibaudet, Tacchino, Tagliaferro. This is a souvenir of Richter in concert but it’s a woeful example of his musicianship.